People are still inexplicably excited about 3D TVs, but putting a 3D display in a home poses some unique problems. First off, no one wants to wear those nerdy glasses at home any more than they want to wear them in a dark movie theater. Additionally, in-home 3D screens suffer from visual noise and distorted images due to viewers’ movement – and the 3D effect is hard to nail for multiple viewers without glasses. In short, the in-home 3D experience hasn’t yet been perfected – but the National Institute of Information and Communications Technology (NICT) is working on bringing glasses-free 3D viewing a little closer to home. 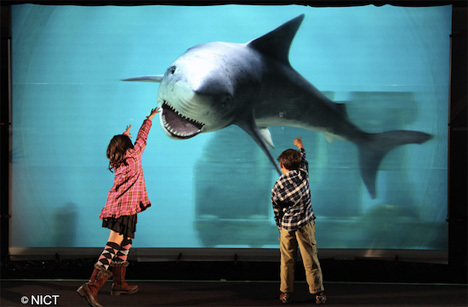 Their 200-inch glasses-free 3D screen made its debut at CES 2011, and it’s a giant step toward freedom from dumb 3D glasses. 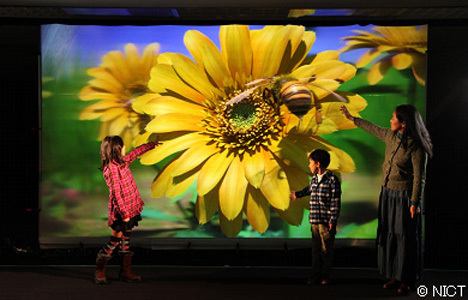 The display lets multiple users see realistic 3D images from different perspectives, even in HD. Unfortunately, since multiple projectors are needed to make this particular display work, it isn’t exactly ideal for in-home use just yet. But coming up with new ways to correct the parallax errors and stripe noise inherent in glasses-free 3D displays puts us a couple of steps closer to watching Jaws in terrifying 3D right in our own living rooms. See more in Audio & TV or under Gadgets. February, 2011.